Hurst Joinery Projects supplied and installed a bespoke joinery package for the exclusive Mere Golf Resort and Spa in Knutsford, Cheshire. This included new bedroom furniture for 81 rooms including 10 junior suites. The bedroom furniture was finished in walnut and included headboard, bedside tables, TV units and fitted wardrobes with lighting. The project also included the supply and fitting of a new bar, reception desk, vanity units and wall panelling to the hotel’s Health Spa. 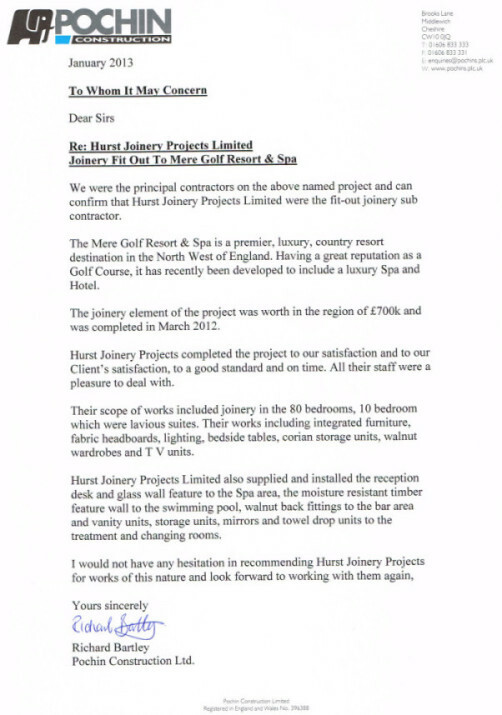 Hurst Joinery Projects completed the project to a good standard and on time. All their staff were a pleasure to deal with.